Where I live everyone takes their own fabric bags for grocery shopping. It is just the done thing; they are so cheap to purchase. This list below of how to eat environmentally friendly is pretty well how I have eaten for years. It is possible to live the 100 mile diet if one is willing to forgo the finer things in life such as fruit and the more unseasonal vegetables. This is a fruitful part of the planet although thanks to Fukushima seafood is now off the roster. The sustainable food movement is sweeping the country. Farmer’s markets, organic produce, genetically modified foods, cage-free eggs ~ they’ve all become part of the cultural lingo. While a lot of this conversation focuses around whether organic foods are better for people’s health, let’s not forget that these trends are also good for the planet. Read on to learn about the 33 environmentally friendly eating habits that are making a difference for our bodies and our earth. Bring a reusable bag on your next shopping trip, and you’ve already helped out the planet. The U.S. alone uses about 100 billion new plastic bags each year, and (brace yourself) this massive production costs 12 million barrels of oil. Worldwide, only about 1% of plastic bags are recycled ~ which means that the rest end up in landfills, oceans or elsewhere in the environment. Why does it matter? Plastic bags don’t biodegrade, but light exposure can degrade them enough to release toxic polymer particles ~ most of which end up in the ocean. Approximately 1 million birds and 100,000 turtles and other sea animals die of starvation each year after ingesting plastic bags, which block their digestive tracts. And public agencies spend millions of dollars on litter clean-up each year. In case you’re wondering, paper bags aren’t much better. Each year, 14 million trees are cut down to make paper shopping bags via a process that requires even more energy than the making of plastic bags. Look for products with minimal packaging, like unwrapped produce or meat straight from the deli counter or butcher. Excess packaging is often made out of unsustainable materials and contributes to waste that ends up in landfills. Perhaps the worst culprit is polystyrene (a.k.a. Styrofoam), which is a suspected carcinogen and is manufactured through an energy-intensive process that creates hazardous waste and greenhouse gases. 3. Don’t buy the bottle. Millions of tons of plastic are used to produce billions of plastic water bottles each year. Save money and lessen waste by drinking tap water from a reusable water bottle. Worried about your health? Try a water filter, or take courage from the fact that a lot of bottled water is likely no better than what’s on tap. Choose to give your money to stores that demonstrate care for the planet, both in their company practices and in the food selections they provide. Look for a selection of local and organic foods as well as store practices that limit waste (think doors on the refrigerated sections so that energy isn’t wasted, minimal and/or recyclable packaging and a store-wide recycling program). 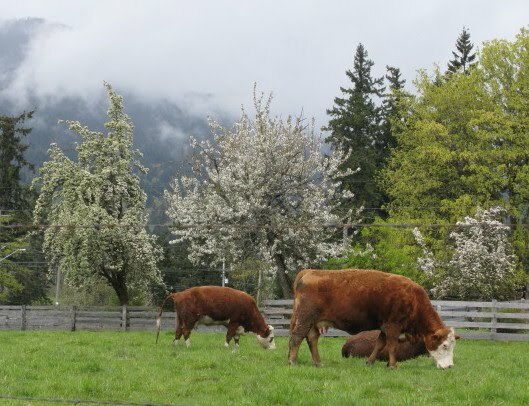 Cowichan Bay farm cattle. Island beef. 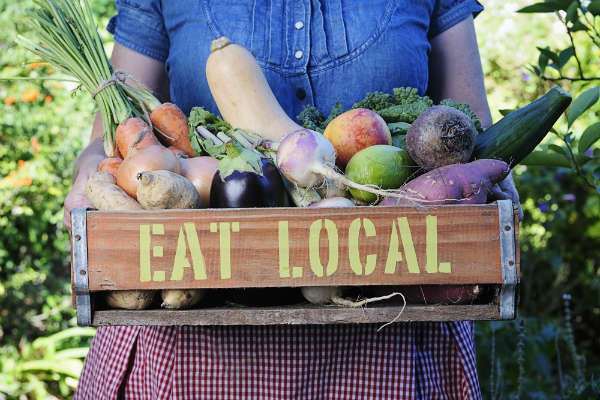 Eating locally grown foods is possibly the best way to lower your carbon footprint when it comes to what you eat. Bonus: Eating locally means that food will be fresher ~ and therefore taste better and perhaps retain more nutrients ~ than food shipped across the globe. 6. Eat more of it. Eat more produce than any other food category, and you’ve already made an impact for the planet (not to mention your body!). The definition of organic can be a little confusing, but food labels can help. Certified organic foods are grown and processed using farming methods that recycle resources and promote biodiversity, without the use of synthetic pesticides, bioengineered genes or petroleum- or sewage-sludge-based fertilizers. Weird. Who wouldn’t want their food grown in sewage sludge? Though their benefits to the environment have a long-term payoff, organic foods can be pricier ~ if you’re on a budget, find out which foods are most worth buying organic, and limit your organic purchases to the ones that make the biggest impact. People can keep chickens in town now although these are from a farm just outside the city. There are laws about crowing roosters however. 8. Eat it raw. Local layers. Chomp down on a raw carrot instead of boiling or sautéing it, and save energy that would otherwise have been used to power cooking appliances. Seasonal nomming allows you to eat locally ~ and we’ve already covered how important local purchasing is for the environment. Check out what’s growing nearby right now. Want to eat more locally, but love to eat strawberries year-round? Learn how to preserve fruits and vegetables so you can eat locally grown produce all year long (it’s bound to impress Grandma, too). You don’t need to live in the wild to grow your own fruits and veggies. Join a community garden, or, if you’re cramped for space, create a vertical garden right inside your window. 12. Get some community support. Not into the idea of growing your own? Consider joining a CSA (short for community supported agriculture), which allows you to reap the benefits of locally grown produce without getting your hands dirty. 13. Eat less of it. Industrially farmed meat has the greatest impact of any food product on the environment. In addition to the tips outlined below, consider making meat less of a staple in your diet. Can’t give up the stuff? Try going meat-free for just one day per week (or one meal per week if you’re really attached). 14. You guessed it: buy local. We’ve said it before and we’re saying it again: buying local is a great way to cut down on the environmental impact of your food. Just imagine how much energy it would take to haul a side of beef from, say, New Zealand, in comparison to transporting it from the local butcher shop. When it comes to meat, the definition of “organic” changes a little. 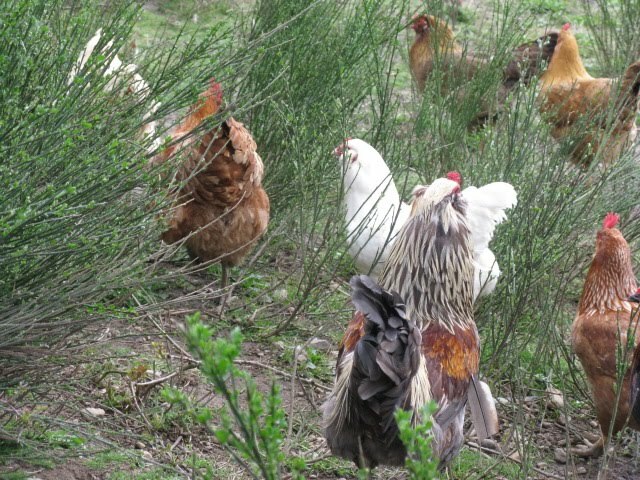 Obviously, chickens aren’t grown in the soil, nor are they (we hope!) conventionally grown with pesticides. Rather, organic livestock must have access to the outdoors and cannot be supplemented with antibiotics or growth hormones. It’s common practice these days to feed growth-producing antibiotics to animals raised for meat, but this results in health risks for the animals ~ and, by extension, the people who eat them. 17. 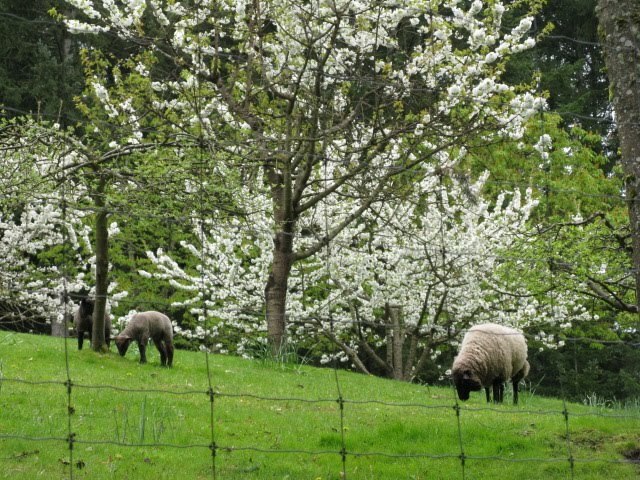 Go out to pasture. Pasture-raised livestock make less of a negative environmental impact. They’re also treated more humanely than their industrially raised counterparts. 18. Look for the label. Figuring out how to buy sustainable seafood is tough: turns out “wild caught” doesn’t necessarily mean it’s environmentally friendly, after all, while some farmed fish are. The easiest way to sort through all the confusion is to look for the label of the Marine Stewardship Council, which guarantees that a product has successfully met requirements for sustainability. Check out these guides to figure out which fish are least endangered and most likely to be farmed sustainably, and use them to guide your buying decisions. Buy U.S. caught or farmed fish. It’s as close as you can get to buying “local” when you live in a land-locked state, and it also means that the product has had the chance to be reviewed by the Marine Stewardship Council, so you have a better sense of the conditions under which the fish were caught. Instead of eating the ever-popular Alaskan salmon along with everybody else at the restaurant, expand your diet and distribute your impact by trying different varieties of fish. Check out these alternatives to some of our fishy favorites ~ you might even find a variety that you like more than tuna. In the process, you’ll reduce the risk of endangering key species. 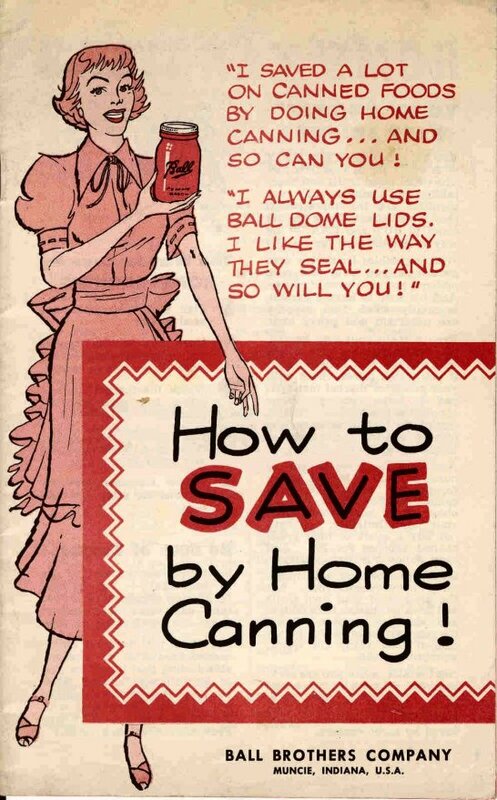 Wouldn’t that have made adolescence easier! Just as livestock raised for consumption are often pumped full of antibiotics, dairy cows are often fed artificial hormones to up their milk production. This has big health impacts for the cows, the people who consume their milk and other dairy products, and the environment (manure lagoons sure don’t sound like a good thing to us). Industrial dairy production is also linked to massive greenhouse gas emissions. Luckily, hormone-free dairy products are readily available. As always when buying local, you’ll be reducing the distance that food must travel ~ and the energy it takes to do so ~ on its way to your plate. It’s better for the environment and for your body. The production of one pound of cheese might produce upwards of 11 lbs. of carbon dioxide, the primary greenhouse gas emitted by human activities and a big driver of climate change. As with meat, you can quickly lessen your environmental impact simply by eating less dairy. Bonus: eliminating common staples from your diet one or two days a week is a chance to experiment with fun new recipes. 26. Order from the tap. Cut down on packaging; ask for tap water instead of bottled. Likewise, save the beer bottle and order on tap. Just because you’re not at the farmer’s market doesn’t mean the market’s bounty isn’t available to you. More and more restaurants are incorporating locally sourced items into their menus. 28. Don’t be afraid to ask. There’s no shame in asking your server or a manager how your food was grown or processed (though it’s probably best not to take it to this extreme). Use cloth napkins and real plates, bowls and utensils. 30. Turn waste into a resource. If you’ve got the inclination and a little bit of free time, give composting a try and turn food scraps into a resource that keeps on giving. Instead of dumping leftovers in the trash, turn them into new meals. It’ll reduce waste and also save on the energy it would have taken to cook a different meal the next day. Leftovers will last twice as long, and you’ll use less energy than you would if you cooked multiple meals. 33. Cook one local meal per week. Challenge yourself to cook one meal a week (or month) that is composed completely of local ingredients. Get some friends in on the action and revel in doing something good for your health and the health of the planet. Do you practice any of these habits on a regular basis? Have we missed any? Share your strategies for eating well for the planet in comments! Buy dried food items such as rice, beans and nuts in bulk. Bring your own mason jars to put them in. As bulk items are sold by weight, you will not want to pay for the weight of the jar, so you will want to weigh the jar empty, which is known as the Tare weight. You can use a scale at home, or use one in the market, either in the bulk or produce sections, or at the checkout line. Labeling the tare weight of the jar is helpful; you can buy labels or make your own with a piece of masking tape and a sharpie. Be sure to also write the PLU code somewhere on the label. When you bring the filled jar to the register, the tare weight will be subtracted from the weight of the food product. It takes a bit of planning ahead, but you will end up with less plastic, your food will remain fresh longer, and will be protected from moisture and bugs or rodents. Also, and I hope this isn't too off-topic, but if you go to a restaurant and anticipate you may have leftovers to bring home, bring your own leftover container(s) with you. The servers at the restaurant will love you for this, and you don't have a nasty styrofoam or plastic container to discard later.